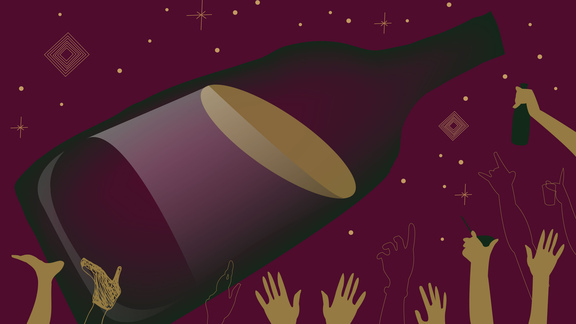 The definitive ‘large and in charge’ party move, brought to you by JUSTIN Vineyards & Winery. The holidays call for grandiosity. But going big (in lieu of going home) comes with own set of problems to solve. Do you break the bank and show up with a spread that puts your fellow guests to shame? Do you sacrifice the one good bottle in your cupboard (you know, the one you’ve been “aging” for some epic moment in the future)? While we can’t solve all your holiday anxieties, what if we told you we had a single solution to the quality over quantity argument raging in your head? Well, here it is: It’s a magnum of wine. Clocking in at a full two wine bottles per single, glorious bottle, magnums are the workhorses of the party. They’re big, they’re bold, and they’re here to make you look very, very good. 1. Woooooo! It’s a party in a bottle! See? Magnums to the rescue. How to best wield the mighty power of the magnum, you ask? First, save it for the show-stopper course. You don’t have to hide it under your chair or anything, but let Joan from accounting pass around the Sauvignon Blanc her boyfriend made in his garage while you all mingle over stuffed mushrooms. You’ll be the hero when the rack of lamb rolls out and you have something like JUSTIN’s 2014 ISOSCELES up your sleeve—a full 1.5 liters of award-winning cabernet sauvignon, merlot, and cabernet franc. Ripe, integrated, and complex, and requires a jazzy presentation to go along with. Nice work, party animal. Secondly, don’t try to single-hand that unless you’re like, real strong. Like The Rock strong. A magnum weighs around six pounds, and us weak-wristed folk are in for a world of hurt if we try to pour that sucker without assistance, especially when the wine starts rushing toward the neck. (We all want to look cool, but don’t be a hero.) No need for a death-grip around the neck, either: we like to support the bottle horizontally with our dominant hand from the underside and keep our non-dominant hand touching the edge of the base that’s facing the ceiling. This provides control and keeps you from dumping the whole thing into Nana’s lap. If you do insist on showing off, make sure you’ve got a good grip; hold the bottle in your dominant hand with your thumb in the punt (that big indentation in the bottom of the bottle) and your fingers supporting the bottle’s underside, and make sure you pour sloooowly. And that’s it. Do the magnum thing this holiday season, and it will become your signature move before you know it. Goodbye, “what do I bring” pre-party meltdown, hello holiday swagger. Do away with imposter syndrome this season and pair like a pro, brought to you in collaboration with JUSTIN Vineyards & Winery. Seriously. We tested all the dilemmas to make sure. Brought to you by JUSTIN Vineyards & Winery! Another epic pairing for JUSTIN Sauvignon Blanc. Made to drink with the inimitable JUSTIN Sauvignon blanc.